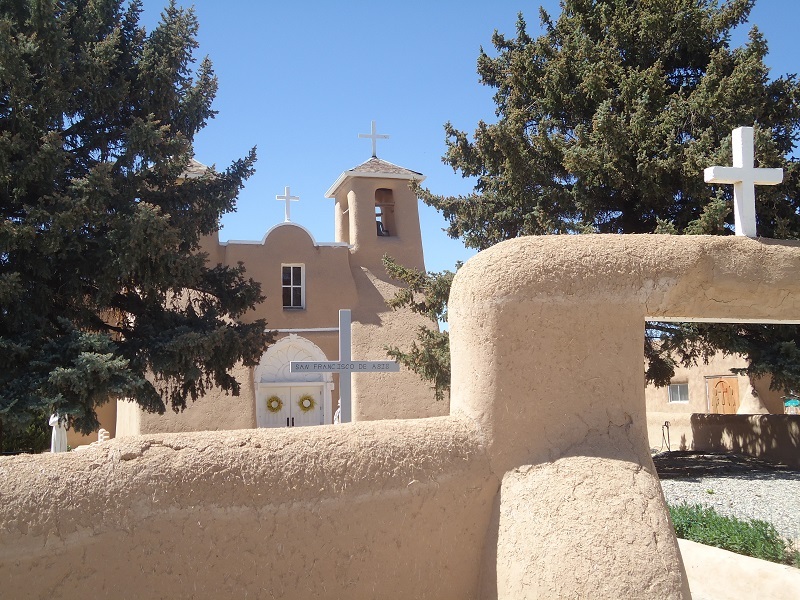 The San Francisco de Asis Mission is the formal name for the old Spanish mission that takes most of the space in the central plaza of Ranchos de Taos, a small town in northern New Mexico, which is situated right outside Taos. 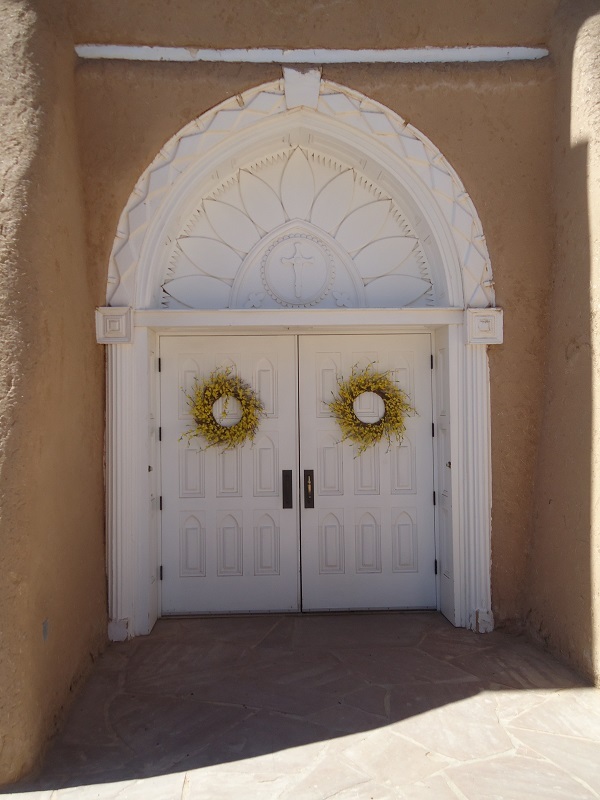 More commonly, the old church is often referred to as the Ranchos de Taos Mission or simply the Ranchos Church. This is one of the few buildings in the world, where the posterior view is better known than the anterior view. The culprit in this case are several early 20th century artists, such as Ansel Adams and Georgia O’Keefe, who made stunning images of the backside, which happens to sit almost adjacent to a major NM state highway. Here is one of the oil paintings of the rear side of the church that Georgia O’Keefe made back in the 30s. 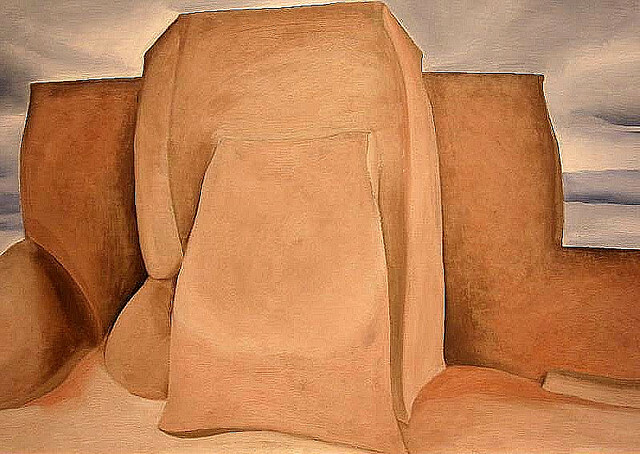 One of several paintings done by Georgia O’Keefe in 1929 & 1930 of the Ranchos Church. Adobe is nothing more than mud (with a heavy clay content) mixed with straw. It is common building element used in the third world, but used much less so in a modern industrial society. The ingredients are inexpensive, easy to apply and durable, especially in drier climates. Adobe churches are still found in Northern New Mexico, where every 5 to 7 years, workers gather to apply a new coat of mud and straw to these structures. This old-fashioned type of adobe should not be confused with the numerous cement-coated structures that are painted an earth color in order to resemble a real adobe building. The adobe structures are not limited to churches and can be found all over the region. 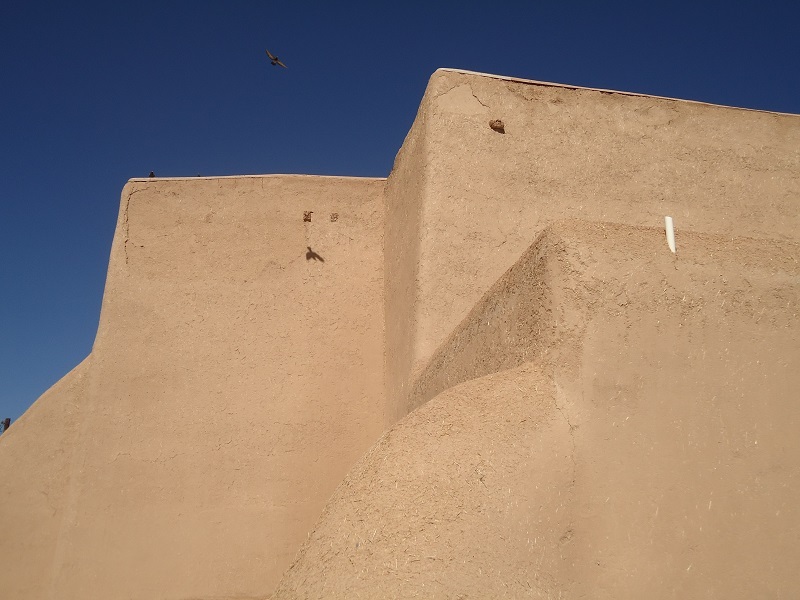 Original adobe walls are built with mud and straw bricks that are air-dried in the Southwestern desert sun and then covered with a mud and straw stucco mixture. This stucco breaks down after awhile , so it has to be re-applied every six years or so. My admiration comes in the way that modern builders and craftsmen are able to keep an old building tradition, despite the advances and onslaught of modern civilization. Yesterday, I had to travel from Santa Fe to Taos in order to pick up some mail and paperwork from my former place of residence. I rode the bus and since my errand only took a few minutes, I ended up with several hours to kill. I decided I would spend this time at this historic landmark located on the highway that heads back to Santa Fe. Funny thing that as a resident, I seldom went here, but now that I live out of town, I decided to go here, take pictures and make a few sketches of this iconic place of worship. The church is officially called the San Francisco de Asis Mission Church and it is located in Ranchos de Taos in Taos County of Northern New Mexico. Ranchos de Taos is a small Hispanic community situated just south of Taos at the western edge of the Sangre de Christo Mountains. This structure is in many ways similar to other Spanish missions situated across Northern New Mexico. Adobe is simply a mixture of mud and straw. Together the two materials combine for added strength. The elixir is easy to make and it used worldwide to create amorphous-shaped buildings, especially in dry climates such as the southwestern U.S. 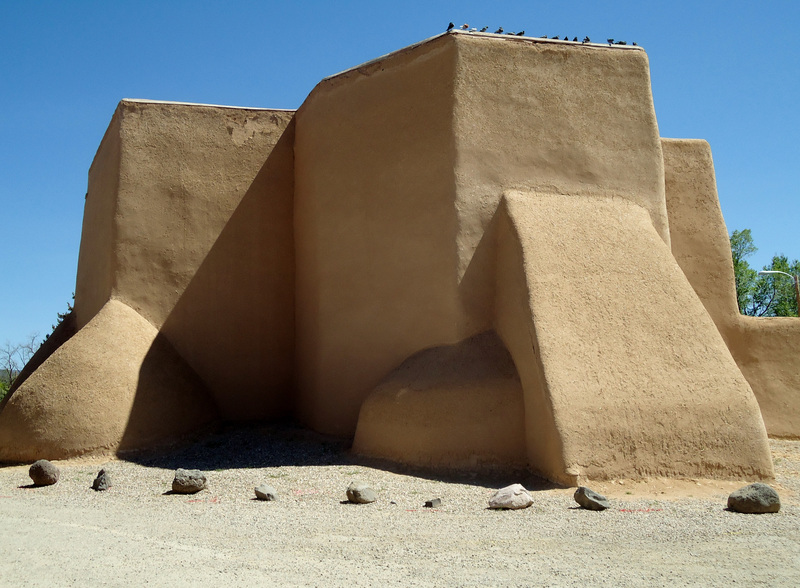 Most adobe buildings have to be re-coated every 5 to 7 years and as a result these structures can develop exterior walls that are quite thick and rounded in their appearance. This might help explain why the church at Ranchos de Taos has taken on its unusual appearance that makes the place so endeared by visual artists and curious travelers. As you approach the church from NM Highway 68, the first thing you will see is the large buttress form that still resembles the O’Keefe painting. To view the front side of the church that bears the twin bell towers and front entrance, it is necessary to exit the two-lane road and drive through the gravel and dirt parking lot until you reach the opposite end. This view, which is pictured below, looks very different from the part of the building that is adjacent to the highway. Perhaps, this arrangement has occurred because the church was built way back in the late 1700s, when local residents used different pathways to get where they were going.